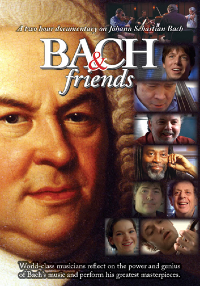 Note: The film Bach and Friends by Michael Lawrence was released on DVD in late January. Had Bach and Friends by documentary filmmaker Michael Lawrence been around when I was a teenager first discovering Bach, I’m not sure what impression I would have taken from it. Given the passionate statements of love from the gamut of performers seen in the film, I would have, at least, concluded that I was in very special company. From interviews with Joshua Bell to Philip Glass, and a dozen or so others in between including Béla Fleck, Hilary Hahn, and Peter Schickele, the film paints a portrait of an effect rather a person—the abstract effect of the music of a genius on others rather than the totality of the historical genius himself. This is both good and unfortunate at the same time. Good, in that the performances on the film are absolutely stellar ones from stellar performers, but unfortunate in that the viewer is left with a very tepid and incomplete idea of who Bach actually was. The film’s emphasis on solo works and solo performers is perhaps understandable given the extremely personal nature of the individual interviewee’s responses. But, given the vast amount of Bach material and his effect on modern performances left unexplored—choral, orchestral, and ensemble—the responses come off as heartfelt and passionate, but historically unrepresentative. Bachophiles will obviously want to obtain and view this DVD, for no other reason than to luxuriate in the performances on the disk and on the performance-only companion disk. They will not learn anything new, but that was probably not Lawrence’s intention.